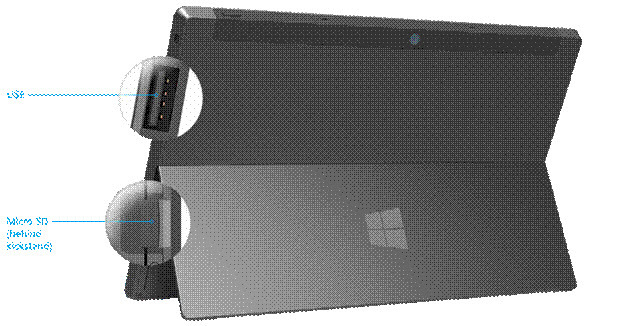 Hello, new Surface 2 holder, I’m glad to share my experience on “How to get Blu-ray movies onto Surface 2 for playback with ease?” For me, Surface 2 is a good media player and game machine to meet our personal entertainment needs. This article is written specially for movie lovers, who always watch movies on Surface 2. You just need a easy-to-use Blu-ray to Surface 2 Converter tool to convert Blu-ray disc/folder/ISO files to Surface 2 playable MP4 format. Pavtube BDMagic can help you can help you achieve easily. 2. Install Blu-ray to Surface 2 Converter, load your Blu-ray disc. Surface 2 is just a laptop without a keyboard. You can plug in a disk drive or any of the other peripherals that can be connected to any Windows computer. 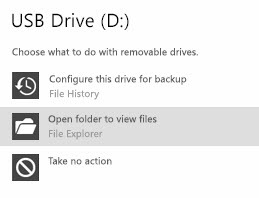 You could connect an external Blu-ray drive to play a Blu-ray disc; but you don’t have to so this every time when you want to play Blu-ray movie on Surface 2 as it’s inconvenient. In my way, I’d prefer to rip Blu-ray disc to MP4 format that works perfect on Surface 2 for playback. Detailed steps: How to convert and transfer Blu-ray to Surface 2playable MP4 format? Now install and run Blu-ray to Surface 2 Converter, insert your Blu-ray disc into your BD drive. Click the “Load file(s)” button to import the Blu-ray movies to the program. This software does not only support Blu-ray disc/folder/ISO, but also able to convert DVD disc/folder/ISO/IFO files to MP4 for playing on Surface 2, Surface Pro 2, Surface RT/Pro tablet. Step 2. Choose MP4 format for Surface 2. 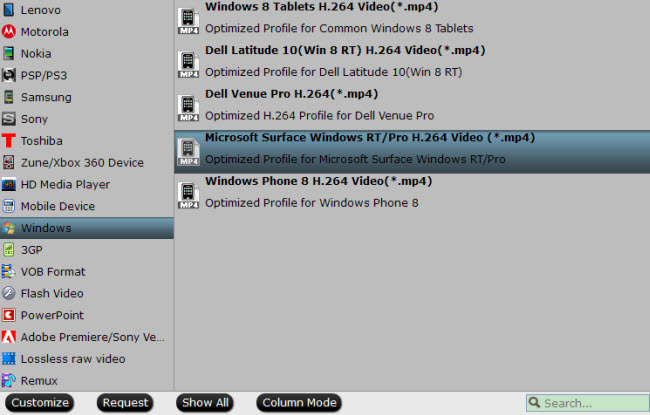 Click “Format” bar, you can get optimized videos for your surface under “Windows -> Microsoft Surface Windows RT/Pro H.264 Video (*.mp4)”. The output videos could fit on your surface 2 perfectly. Or you can enter “Surface” in the small search box at bottom right corner. Step 4. Start Blu-ray to Surface 2 MP4 conversion. Just click “Convert” to start conversion. The converting speed depends on the file size of Blu-ray movies and your CPU. 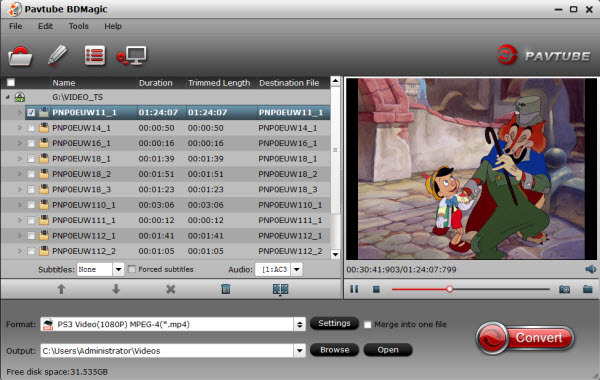 Pavtube BDMagic takes advantage of the NVIDIA CUDA technology and AMD APP technology, and the conversion speed can be increased up to 6 times faster than ever before. When the Blu-ray to Surface 2 conversion finished, you can get the converted Blu-ray rips in .mp4 format by tapping the “Open” button. 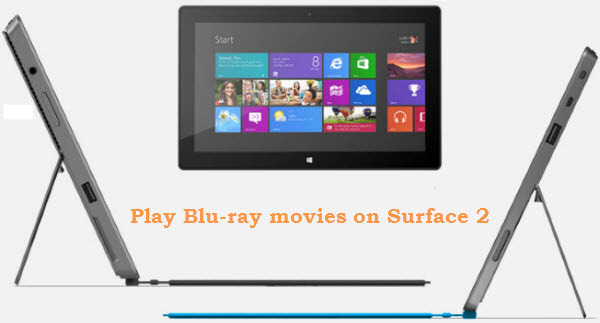 Now, freely transfer Blu-ray to Surface 2 and watch movies on Surface 2 anytime and anywhere you like. How to transfer media files to Surface 2? Open the Settings charm, tap or click Change PC settings. Use a USB flash drive or a memory card — microSD, microSDHC, or micro SDXC cards all work with Surface.